My new fashion accessory! Stylish, non? 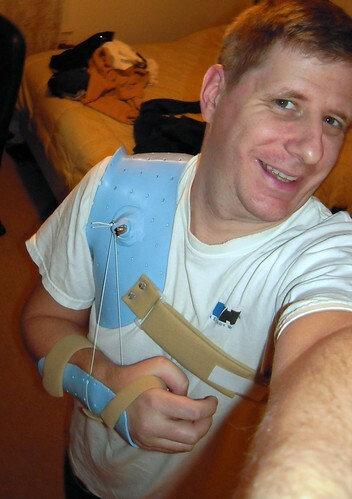 This is a splint that I'm now wearing around the house in the evenings. Simple design. String around the wrist gets tighened to a mount on the shoulder. The shoulder mount is just like the string peg on a guitar. Similarly one can really crank up the tension, and hold it for super long periods. Seems effective. No complaints and only minimal pain. The pain's no worse than a strained muscle or hyper-extended joint. Which, is exactly what I'm doing with the splint. My therapists have been super, and the treatments are working. Elbows are long injuries. 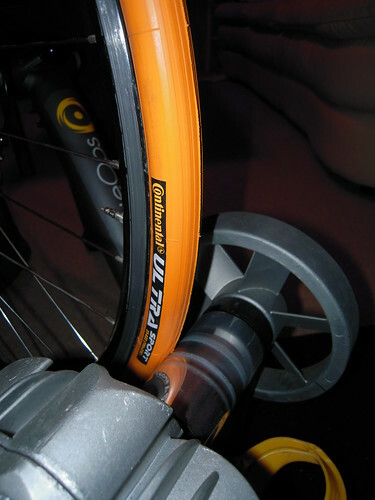 My house brand tire -Vittoria Open Corsa- while great on the road absolutely shred on the trainer. Most winters I only minimally ride the trainer. It hasn't been a big deal. This year of course is different. Given the months of trainer time ahead... no reason to waste perfectly good road tires in my living room. I mounted up a Continental Hometrainer tire. All I have to say is... mounting a tire with 1-1/2 hands is not fun. Bring the patience and utilize the feet and toes. Pics of this process would have been comedy gold! 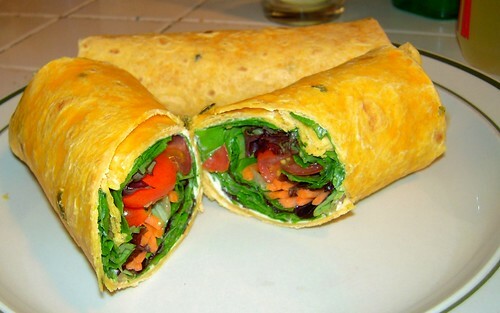 Focusing on eating correctly again... some veggie wraps make a nice meal. Simply take some spring mix pre-pack salad, shoestring carrots, and some grape tomatoes. Put on a tortilla with a bit of cream cheese. The real secret is to take a bit of lemon juice on the veggies. Really brings out the flavor. Wrap. Eat. Yum.